This weeks planner pages use The Reject Shops Sunshine collection. I believe this collection came out last year but I didn’t buy it til early this year. We had had a lot of hot sunny weather so I chose Sunshine, now it won’t stop raining! As you an see I cut the bus in half. Don’t be afraid to cut your embellishments to make them fit your space! I really liked the bus but it was too big to fit on one day and leave enough room to write. Cutting it in half let me keep the space needed. Not only did I use colourful washi for the borders but I also used washi for my checkboxes this week. Do you have washi you could use like this? I am seriously thinking about making a separate channel for planner related things. That way the crafty peeps don’t get spammed by my planner stuff and vice versa. Go create some arty crafty alchemy yourselves. Hope you enjoyed this weeks planning. For this weeks planner layout I used the Kaisercraft Island Escape paper pad. I originally bought the large Escape and the small Island escape pads for a project but no longer need them for it… Because I wanted to give you a flip through I also decided why not make a planner layout too. You can see a previous layout here. If you haven’t noticed I really enjoy using matching elements from a range to do my planner layouts as it makes it nice and quick. I can also use the same range several times and get a completely different look. Quick and easy is my thing these days as I have been super busy with assignments and things I don’t usually do. There are two downsides to the Island Escape collection for me. Firstly the large amount of woodgrain papers in the Escape 12″ pad. 14 of the 36 sheets are wood grain, overone third. Secondly most of the Island Escape Collectables are quite large so not great for planners and cards. They are more geared towards scrapbooking I think. Hope you are creating your own planner magic, see you all next time. Today I am sharing how I decorated my planner for the whole month of August. It was a bit of a marathon! Keep reading to see what I used. The Reject Shops amazing paper pads and ephemera packs are mostly what I used to decorate, though I did throw in a Kaisercraft at the end. Unfortunately I don’t own many matching Kaisercraft pads and ephemera. I started with my favourite pad and ephemera from The Reject Shop, the Fanciful collection. 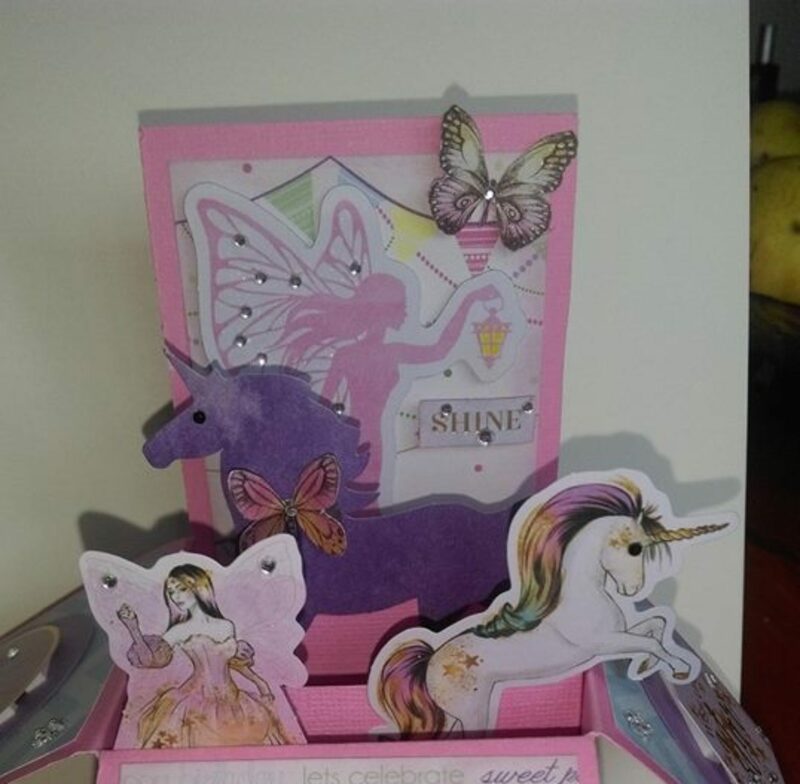 Mermaids, unicorns and fairies, swoon! All in pretty pinks and purples. I used one of each along with some other ephemera to accent the papers. Next I used my Here & Now journal cards and ephemera as I don’t have the paper pad that matched this collection. I trimmed two journal cards down and used pieces as matting, borders and an accent piece. I also used one of the larger pieces as a replacement for paper. The ephemera pack for this collection was huge. 180 pieces! It was hard to choose what to put on the page! Then I used the Twig & Twine Collection. Opting for the more pale orange pieces instead of the stronger peach colour. This collection even has butterflies, which is another of my favourite things! This collection has a lot of vintagey goodness 🙂 I also stamped some plain washi to match. This next one I think is my favourite layout for the month. I used the gorgeous Carpe Diem collection. Beautiful purples, mauves, pinks and blues. Again I cut up a journalling card in place of washi as well as some glitter tape. I had to add the gorgeous rose even though it didn’t leave me much space to write lol. Lastly I used Golden Grove by Kaisercraft with it’s lovely golden yellows to indicate coming into spring. There was a paper with lot’s of strips I utilised as washi. I used some of the bigger pieces of ephemera for this week so did not need to use many. Hopefully you enjoyed my month long planning lay outs. Go do some arty crafty alchemy yourselves. Catch you all later.